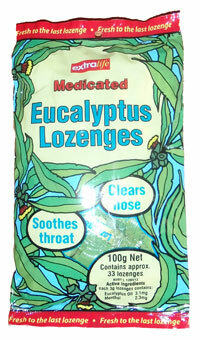 Eucalyptus Lozenges with honey and lemon, which help to sooth an irritated cough, clear a blocked nose and relieve colds whilst making your breath fresh. Each pack contains approximately 33 foil wrapped 3g lozenges which have active ingredients of eucalyptus oil (3.1mg) and menthol (2.3mg). They contain no artificial colours, flavours or preservatives and are gluten free. Sugar, Glucose, Citric Acid, Eucalyptus Oil, lemon Oil, Honey Flavour Added, Menthol, Water Added. I am English but brought up in Brisbane, Queensland and these were one of many sweets I used to buy.